Really interesting blog on mental health and long-term psychological trauma following war. I know that some readers of my blog (and thanks for that!) already know that throughout 2013 I was writing a book called Shell Shocked Britain commissioned by Pen & Sword History . We are now in the final edit stage, with proof-reading to come before it is finally published in October of this year, marking both the Centenary of the start of the First World War but also the month in which World Mental Health Day falls. 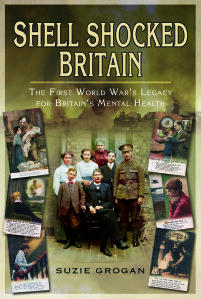 The publisher has given a sub-title to the book – ‘The First World War’s Legacy for Britain’s Mental Health‘. I cannot argue, as it is exactly what the book is about.